About a quarter of the cars on the roads of Frankfurt would be affected by the ban. FRANKFURT -- A looming ban of older diesel vehicles in Frankfurt faces a legal challenge from the state government, deepening the controversy over how to handle the fallout from Volkswagen Group's emissions-cheating scandal in Germany. The state government of Hesse said on Wednesday it would appeal a court decision that would ban polluting older models from the streets of Frankfurt starting next February. Frankfurt is emerging as a test case on how to handle rising air pollution in German cities, following a landmark ruling by the country's top federal court in February that opened the door to such inner-city bans. Hesse Prime Minister Volker Bouffier, a member of Chancellor Angela Merkel's Christian Democrats, said a series of measures he proposes would work as well as the diesel ban. "Planned measures, such as deploying electric buses, building better cycle paths and more park-and-ride offerings would, in practice, have the same effect as a general driving ban," he said in a joint statement with Environment Minister Priska Hinz. The proposed bans follow the scandal at VW Group, where diesel models were found to have exceeded emissions limits, leaving vehicles on the road that are far more polluting than their buyers were led to believe. Merkel's government has, meanwhile, hesitated over whether to require automakers to carry out costly retrofits on older models with exhaust-cleaning systems that would help reduce urban air pollution. 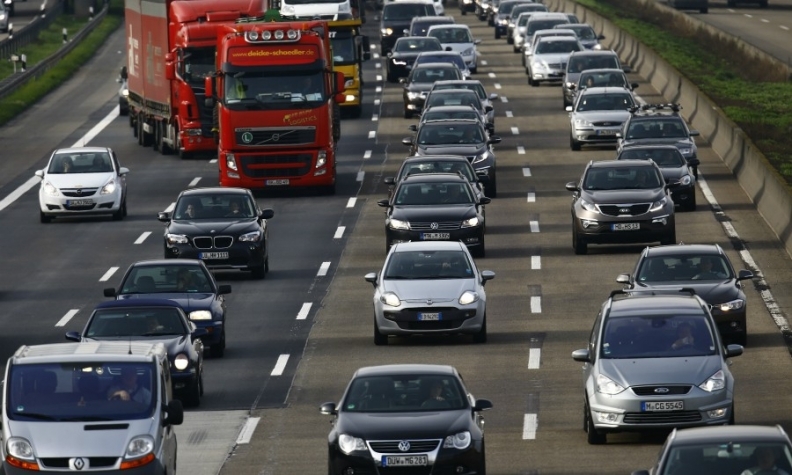 About a quarter of the cars on the roads of Frankfurt, whose population nearly doubles by day as commuters come into the city, would be affected by the court-ordered ban. At first, diesel cars meeting Euro 4 standards and gasoline-powered vehicles running to Euro 1 and 2 would be barred from the city. The ban would be extended to Euro 5 diesels starting next September, but not to newer, Euro 6 models. Deutsche Umwelthilfe, the environmental group that brought the Frankfurt case, argues that banning diesels is the only way to meet European Union clean air rules that stipulate nitrogen dioxide pollution should not exceed 40 micrograms per cubic meter of air on average. The city of Hamburg this year voluntarily blocked diesel models that fail to meet the Euro 6 emissions standard from selected roads. Other cities including Aachen, Dusseldorf and Stuttgart, are also considering bans.